First let me compliment you on your lovely red uniform. 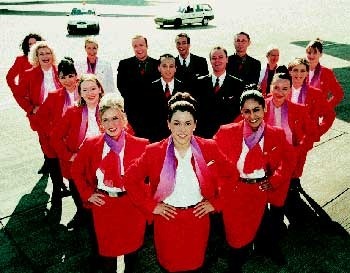 You remind me of my days as a cabin attendant and how I wore my uniform with as much, if not more, pride. Those were good days! Difficult Darren – As he trundles down the jet bridge laden down with several pieces of ‘hand luggage’, you heave a sigh. You know that DD is going to refuse to check in any of those bags even when you ask him politely and will insist you find room for them in the overhead compartments. You know this is just the first of much aggravation he will cause you and you wish it was standard policy to drug DD‘s and his ilk’s welcome-on-board drinks with Valium. Sigh! Aisle Be Damned Alfred – ABDA loves aisle seats. He doesn’t seem to understand that the aisle is for public access as he spills over and out of his seat and stretches out his leg, tripping you up every time you walk down. He never apologises but instead glares at you for daring to invade what he considers his personal space. You pointedly ignore him, making sure to step over the offending appendage but you soon get your revenge when you push the trolley right into it. You put on an appropriate apologetic look while inquiring if he is alright, meanwhile you are tearing up with laughter on the inside. Serves him right! Whining Winifred – WW complains loudly about everything, the long check-in queues, the security checks, duty-free prices, her allocated seat, crying babies, the food and the list goes on. Nothing is good enough for her. She always has a notebook and pen handy to write down your name and spends hours everyday writing letters of complaint to airline management. Unfortunately for her, there’s been a change of policy in doling out free tickets as compensation. She is not a happy camper. Tough! Frequent Flyer Fredrick – You see FFF every few weeks. He’s pretty easy-going and you are on first-name basis with each other. When there’s a lull in your duties, he usually comes up to the galley and regales the crew with tales of his many travels. You make sure you upgrade him every chance you get. Nice guy! 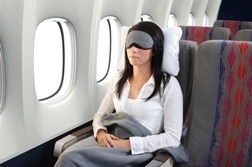 Show-off Susan – SoS usually flies Premium Economy but you would think it was First Class the way she carries on. She talks down to you as though you are subservient to her. She never says ‘please’ or ‘thank you’. She demands to be upgraded to Business or First Class every time as though it is her right, and insists on using their toilets as well. If she doesn’t get upgraded, then it has to be a bulkhead seat. You happily oblige as you know that all the other seats on that row will be occupied by families with babies and young children. You send up a prayer of thanksgiving when the babies cry throughout the 10-hour flight. There is a God after all! I bet you’re wondering why this passenger felt the need to write you a letter so I won’t waste any more of your time, I know you’re busy dealing with all of the passengers I mentioned above. Well, you see, I’ve been looking forward to this trip for a long time. In the run up to now, I’ve been busy doing stuff, the stuff working mums do and I’m exhausted. I really need to sleep. So I just wanted to ask that you please not wake me for any reason. Don’t worry about my safety, I will have my seat belt firmly in place under my blanket. Don’t worry about my food, I will have breakfast when I arrive. Don’t worry about any emergencies, I will wake up and take necessary action including shouting ‘the blood of Jesus’ loudly. One less passenger to serve. One less tray to clear. One less obstacle to meander around in the narrow aisle. In effect, less work for you. And that’s always a welcome relief for cabin crew on a transatlantic flight. I look forward to seeing you on boarding and again, on landing. Here’s to a smooth flight and hoping you get the most compliant passengers you could ever have. PS. I thought you should know that I wouldn’t, at all, be averse to the idea of being upgraded. Not that I would ask though, far be it from me to do so! You already have your hands full and I would be the last person to want to burden you further. It’s Mothers’ Day in North America, however I’d like to celebrate and serenade mothers everywhere with these timeless classics. Marriage has taught me a lot of things, some of which are, to choose my battles wisely, learn to compromise, be slow to jump to conclusions, understand timing, to mention just a few. However the one I wish to talk about now is the fine art of disagreeing agreeably. I call it a ‘fine art’ because it requires great skill and highly developed techniques which are, sadly, rather lacking in a lot of relationships today. It is wishful thinking to believe that you can go through life without disagreements. People are as different and as unique as snowflakes which means we will not always be on the same page at the same time, if ever. In our day-to-day dealings with other human beings, potential for conflict and disagreement is rife. With the advancements in technology, a huge proportion of our interactions and relationships are conducted electronically. Without the benefit of body language, facial expressions or hand gestures, there is even more room for misinterpretation and misunderstanding. I’m appalled when I read some of the slinging match threads on social media sites that pass for comments. Trying to avoid disagreements is wisdom but totally shying away from it, is folly and an exercise in futility. Since it is inevitable, it behoves us to learn how to do it without destroying our relationships, and I’m not just talking about marriage. 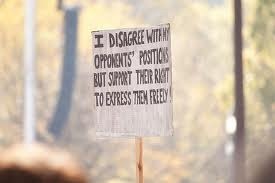 Is it possible to disagree with another person’s point of view without provoking them or being provoked yourself? Most of the time, when we find ourselves in a situation where we disagree with something someone says or does, it almost always invariably leads to each party adopting a polarised “I am right, you are wrong”stance. We then get defensive and in trying to maintain our ‘rightness’, sometimes abandon the real issue and resort to trading insults. The fact that you disagree with someone or vice versa doesn’t automatically make them a bad person. They simply have a different opinion to yours. Sometimes there isn’t necessarily a right or wrong opinion; it is just a different opinion. It is not always essential that either of you adopt the other’s opinion but it is usually helpful if you both acknowledge them without coming to blows. Don’t take it personally. Don’t make it about you or about the other person, keep it about the issue. Choose your battles. Not every single thing is worth arguing about. Be the bigger man/woman, bite your tongue and keep your mouth shut. No one but a mad person likes to argue with themself. If your ‘opponent’ (and I use the word rather loosely) notices it’s not such a big deal to you, they will probably drop it and move on to something else. It’s ok to be ‘wrong’ sometimes. Have an open mind, you may actually be wrong. Don’t get so hooked up on proving that you are right to the detriment of the relationship. Be respectful and considerate. Don’t dismiss other people’s ideas or opinions simply because they differ from yours. Forget about winning or losing. You may win the battle but end up losing the war if you make every argument about winning and losing. Whereas you both can come out winners if you work to understand each other’s point of view. Be willing to apologise. In heated moments, you may say some hurtful things while trying to drive home your point. Don’t be too proud to admit it and say you’re sorry. Have you got any tips for dealing with conflicts and disagreements? Please share them.